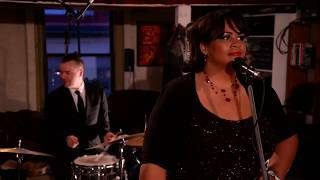 With a vocal style that encompasses the soul of Etta James, and Carmen McRae, the modernity of Holly Cole and the playfulness of Jann Arden; Maureen Washington evokes comparison to some of the great female Jazz singers of our time yet remains one of a kind. Maureen Washington songstress for a variety of different ensembles, began her music career in Prince George where she sang in a funk, blues, swing, jazz band named BOP, who recorded an EP, taught Jazz clinics, and played local venues and festivals. The band BOP was widely acclaimed in the area as the best dance band, performing rearranged classics and lively originals. Along with the band she also performed for restaurants and corporate events with pianist David Sproule. Now based in Victoria, Maureen performs with many different configurations: from duos to sextets at several high end venues around Vancouver Island. She also has performed at multiple events during the International Victoria Jazz Fest 2008-2018 and Vancouver Island Blues Bash 2017-18. Other Main-stage festivals she has appeared at Salt Spring Island Garlic Festival 2015-16, and Pender Harbour Jazz Festival 2016. She's had the privilege opening for The Blind Boys of Alabama's Christmas show, Jazz legend Joe Lovano and Jazz Legend Vincent Herring, as well as singing back ground vocals on Folk legend Valdy's last album "Between The Lines"
As one of Victoria's most sought after vocalist she has the honor of working with some of BC's best musicians such as Karel Roessingh, Joey Smith, Damian Graham, Daniel Cook & Miles Black. Maureen has worked extensively in the music industry, as a singer songwriter, vocal instructor, performer, and has hosted and performed main stage for 4 years (2004 - 2007) at the Prince George International Folk Fest, sharing the stage with Bruce Cockburn, Janis Ian, Martyn Joseph and twice hosted festival clinics with Florida's Lee Boys, Ruthie Foster and with Canadian Indie Rock singer, Amy Millan. She also performed for the Coldsnap Music Festival opening for the Lee Boys 2010 and Juno Nominee, Jaclyn Guillou 2016. Early in her career Maureen also created hosted a musicians showcase, providing an opportunity for local talent to be seen in a coffee house setting.